In a previous post on blogging I mentioned how it can be an amazing hobby but a tough job. This sparked a few requests to talk about how I make an income from blogging. As I previously mentioned most full-time bloggers also work freelance and/or have outside streams of income (e-books, mentoring/talks, online workshops, Youtube) as blogging alone isn't generally a sustainable income. This is the case for myself with 70% of my income coming from blogging and 30% from freelance work with online brands. Building an income from a blog takes time, a long time, but if you start off with low expectations you will see progress and results. Whether you're blogging as a hobby or considering taking it part-time or even full-time hopefully sharing my main income streams will be of some help. In the early days of Makeup Savvy when I was blogging purely as a hobby I decided to give Adsense a go. It was easy enough to setup, I didn't have to maintain it and it would pay monthly if I met the £60 threshold. I had low expectations so was pleased even if I made under £1 per day! Since 2011 to 2013/2014 my monthly earnings had only increased but then started to level off. This is when I decided to play around with my ad sizes and the position of them, making sure there was one above the fold (upper part of the website before scrolling down) and near to popular links. Doing this made me realise just how much I'd overlooked the position of my ads as I instantly saw an increase in my daily revenue. I now make an income each month that I'm fairly pleased with, though I'm always trying to improve on my monthly page views to increase my click-through percentage. Whether you're blogging as a hobby (and want to earn a bit of money for your efforts), as a part time job or your career, Google Adsense should be your first port of call. In the early days you probably won't meet the £60 threshold but don't let this deter you. With regular content and time most people do see revenue/clicks increasing. Do's & Don'ts - Always set ads to display both text and images. NEVER click your own ads. If you are unfamiliar with what Affiliate Marketing/Programs are you may want to head over to this post I wrote forever ago, it's a tricky thing to summarise so I don't want to just ramble on and on in this post to explain what it is. Affiliate programs were the next thing I looked at when I became more serious about blogging. This was more trial and error than linking up Adsense on my blog as I joined a few programs that just didn't have an array of brands on board and for that reason I failed to meet their payment thresholds even after months and months. Then by chance Skimlinks actually contacted me with a generic email introducing themselves. Instantly I realised they had so many large brands/merchants on board (Feel Unique, eBay, Look Fantastic, Selfridges, Debenhams) and had an incredibly low payment threshold of only £7! Fast forward from my first payment of £19 back in November 2011, I now make between £100-250 each month. Not a huge amount but a stable and reliable income source that contributes to a full-time wage. I also recently decided to sign-up to Amazon Associates as Amazon originally were with Skimlinks but they parted ways at the end of 2013. So far I've been pleased with the revenue I've earn and would 100% recommend. Over the past few years I've heard a few negatives comments in the beauty blogging community about bloggers that use affiliate programs, I feel this really is confined to beauty and fashion blogging for some reason. Affiliate programs definitely aren't frown upon as a whole as long as you remember to disclosure it somewhere on your blog. Personally I feel I am already linking to products I recommend/review for the convenience of anyone that wants to purchase the product online and the link being an affiliate one doesn't change the price of the item for the buyer. However it does mean I benefit with a small percentage of the sale which literally is pennies, but pennies do add up! Do's & Don'ts - Any blog post with lots of product links has a better chance of receiving sales (therefore making you potential revenue) wish list style posts, hauls and top picks from specific websites all work well, however this doesn't mean you should link to products you don't actually like! Also mentioning and linking to sales or offers is a good way to gain revenue. Once I decided to go full-time as a blogger (as well as blogging freelance) I knew I needed other income streams that were reliable. I had little knowledge of advertising networks but knew they provided larger ads that could pay considerably more than the average Adsense ads. I first joined an advertising network that provided me with some good high revenue campaigns but payments were slow coming and eventually the company were offering less and less advertising campaigns. This was when I decided to apply to join Mode Media (previously known as Glam media) - a popular ad network for a lot of beauty & fashion blogs in the U.S and US. Mode Media provide the fairly large wrap around ads that you see on my blog and give sponsored posts opportunities (I haven't participated in these so far due to the high criteria that needs to be met). The size of the ads may not be for some however if you are looking to make a living from blogging then it may be an avenue you want to go down. 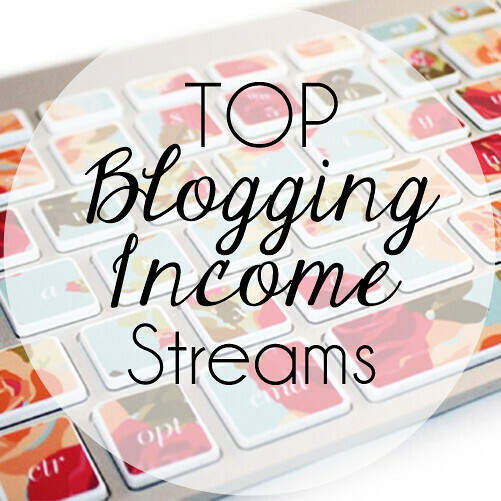 Other (less reliable) income streams to consider - Sponsored post (always make sure to give no-follow links to stay in-line with Google guidelines), private ads (commonly placed in the sidebar), blogger ads (giving fellow bloggers advertising space at a lower rate). If you have any questions please feel free to ask them in the comments!